I'm a beef person. As much as I love pork, if given a choice, I would definitely choose beef. 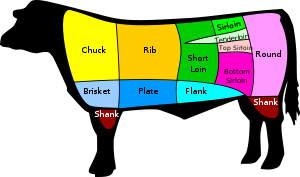 Shame to say, as much as I love it, I barely know much about the different cuts of beef except the famous few like sirloin or t-bone. Nor do I know what's the different between normal beef with angus or wagyu. And so, after the enligthening in NZ where I got to see a real angus beef, I want to learn more. And so Google I did. And what's the difference between wagyu/kobe and angus? The latter is found mostly in US and AU and has lower fat in the meat. And so as a summary, order porterhouse/sirloin or filet mignon next time you crave for a steak. They're the most tender and also burns a hole in your pocket.